Wouldn't genetic predisposition trump "bad mechanics"? Interesting read, but I still prefer to look up proper form on a website like ExRx, rather than look at a really developed guy at the gym. testosterone, and as far as I know, blood sodium levels and the healing power of bismuth. Conclusions: Rest between sets, don't train too long in a session, sometimes tonnage is important and sometimes intensity. And so on. Was thinking, gosh, really? Imagine that! I saw a discussion between some pretty well known people in our field the other day on mTor and thought the same thing. "You mean we have to lift weights and recover?" Brilliant! 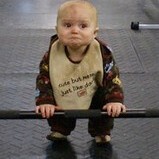 Jason Nunn wrote: "You mean we have to lift weights and recover?" Brilliant! that's exactly the kind of blue-sky thinking we need around here!